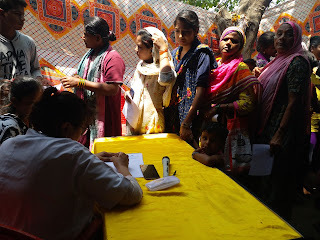 Mumbai, 6-April-2019: The Don Bosco Development Society (DBDS), organized a free health and eye check-up camp for the women and children residing in Kokari Aagar transit camp in Sion Koliwada. 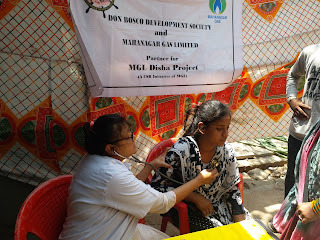 161 patients (26 children, 46 men and 89 women) were examined by the doctor in this camp which was held under the aegis of ‘MGL Disha Project’ supported by Mahanagar Gas Limited. Ms. Basanti Solanki (DBDS-Staff) welcomed the doctors and their para-medical staff. Ms. Surekha Pednekar (Project Officer - DBDS) visited medical camp and personally supervised various activities of the health camp. The objective of this health camp was to provide needed medical care to patients. Patients were screened for vision problem and anaemia using a symptoms questionnaire. Dr. Smita Trivedi and Mr. Pramod along with 2 Nurse and 2 Medical Social workers examined the patients during this health camp. The doctors distributed iron, vitamin tablets and skin ointment to patients who were anaemic and suffering from fungal infections, Scabies etc. No Cataract patients were identify in this camp. 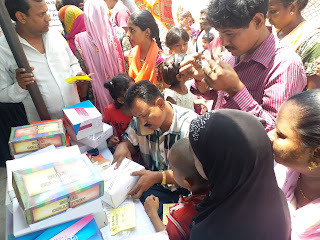 The DBDS staff and volunteers from the slum were extremely helpful in logistical arrangement such as putting up chairs and tables, arranging water, visiting families in slums and informing them about the health camp and in managing the crowd. Local people were very happy with this health camp and praised the efforts of Mahanagar Gas Limited. Prakash Yadav (volunteer) proposed the vote of thanks at the end.